Originally Written and Posted at Epinions.com on 1/7/07 w/ Additional Edits & Revisions. Based on P.D. James' novel The Children of Men, Children of Men is the story of a dystopian United Kingdom in 2027 where a man tries to save mankind's extinction from infertility by trying to help a young pregnant woman from political radicals and others. Directed by Alfonso Cuaron and screenplay by Cuaron, Timothy J. Sexton, David Arata, Mark Fergus, and Hawk Ostby, the film is a dystopian sci-fi drama where the world is in danger by declining population and infertility where a man tries to bring hope. Starring Clive Owen, Julianne Moore, Michael Caine, Charlie Hunnam, Claire-Hope Ashitey, Pam Ferris, Peter Mullan, Chiwetel Ejiofor, and Danny Huston. Children of Men is a brilliant yet harrowing film from Alfonso Cuaron. Following the death of the youngest person living on Earth named Diego (Juan Gabriel Yacuzzi) at 18 years old, total has erupted in totalitarian Britain as a former activist named Theo (Clive Owen) goes to an unsecured countryside to meet an eccentric scientist named Jasper (Michael Caine). Still mourning the loss of his son years ago, Theo has given up activism until he was kidnapped by a group of radicals led by his wife Julian (Julianne Moore) and her cohorts Luke (Chiwetel Ejifor) and Patric (Charlie Hunnam). Julian wants some transfer papers for a person to get around the immigration camps as Theo asks his cousin Nigel (Danny Huston) for help since he's a government official though Nigel warns him about the chaos that is to happen from immigrants and anarchists. Theo ends up getting a different kind of transfer paper as he, Julian, Luke, and a midwife accompany a young woman named Kee (Claire-Hope Ashitey) to a drive through the country to reach a mythical ship where a group of scientists are trying to find the cure to end infertility. Instead, things go wrong during the trip where Theo had to return to a remote farm as Luke takes over. Theo learns that Kee is pregnant with a child as she reluctantly makes the decision to stay with Luke to not make any risks. When Theo learns what Luke and Patric are really doing, he decides to take Kee and Miriam away from the farm as they hide out in Jasper's place. With Jasper's help, they learn that a ship called Tomorrow is the project that will hope to end fertility with Kee as the thing they need. With Theo, Miriam, and Kee go into Jasper's car to the sea while Jasper holds off Luke, the trio continue onto their road trip as they meet Jasper's contact in a man named Syd (Peter Mullan) who sends them to the immigration camps to hide where Kee starts to feel contractions. At the camp, things become troubling forcing Kee and Theo to make their way through the decayed British ghettos where they meet a gypsy named Marchika (Oana Pellea) who reveals that Theo and Kee are fugitives. With trouble brewing as radicals and governments are fighting, Theo and Kee try to find way to get to a boat and evade those that are trying to find them. Though dystopian ideals is nothing new, the idea of a world in a state of chaos itself due to the fact that there's no future is still something that is scary. What Alfonso Cuaron and his writers bring is the idea that a world where no children is going to come to save mankind as the world is on the brink of collapse as hope finally arrives. Yet, the film's themes of dystopia is really the background in which the film is about a man's revitalized activism takes hold as he tries to save a young woman in having her child that could save the world from the government and those with political motives against the government. The result is truly an intense, harrowing film that Cuaron brings. While the script is filled with provocative tales of science, humanity, and politics, its his direction that brings weight to the film's themes and images. While Cuaron does add a little bit of humor in terms of dialogue and a few references (including one for fans of Pink Floyd), he still maintains the idea of Britain in a bleak state where the world is in chaos. Some of the film's intense scenes are shot with hand-held cameras with little moments of sunshine to reveal the brief, serene peace of Britain with most of it still shivering with its grey, morose look. Cuaron also doesn't sugarcoat the brutality of totalitarian Britain where officers will kill people, immigrants or not, depending on what's going on as citizens are being watched left and right. The drama and development of characters are true to the situation they're in as it's really Theo's story and how he tries to do right despite his own flaws and idealism. There's even a moment that amidst the brutality in one of the film's fighting, battle sequences where a moment of peace and realism occur into how absurd everything is and it is brief. It is there where in Cuaron's direction, that the film has a moment that can't be replicated into any other film and it's truly an idea that can be felt among its audience. Helping Cuaron in his visual presentation is his longtime cinematographer Emmanuel Lubezki. Fresh off from shooting Terrence Malick's 2005 film, The New World, Cuaron goes from the beauty of Malick's historical revision of 17th Century Virginia to the bleak futurism of Britain in the 21st Century. Lubezki's lighting and grey vision really adds nuance and atmosphere to every frame where in the interior settings, he brings little amounts of artificiality to bring a realism while his exterior shots are exquisite. To the brief moments of sun to the shade of green and grey in other sequences that reveals Britain in a new light where it's not tinted or given any kind of style. It looks and feels real as Lubezki does incredible work with its look. Production designers Jim Clay and Geoffrey Kirkland along with visual effects supervisors Frazer Churchill and Timothy Webber did amazing work in recreating futuristic London and Britain with graffiti on the walls plus buildings and bridges that are created by some visual effects to convey the sense of decay of the future. Costume designer Jany Temime also does great work in the costumes of its cast where there's no flashy, bright clothing as everything looks contemporary and dark. Cuaron and editor Alex Rodriguez do some excellent work in the editing in bringing a nice, rhythmic pace to the film's intense scenes while bringing some long shots to convey the action where no cuts were involved. Sound designer Richard Beggs does amazing work in the sound with his sound mixes of battle scenes and screaming along with moments of serenity to convey the atmosphere. Beggs work in this along with Sofia Coppola's Marie-Antoinette are the highlights in the year of sound for film. The film's score is largely ambient and operatic from composer John Tavener that adds the sense of melancholia and drabness of the world while the film's soundtrack is wonderfully diverse. With cuts by Radiohead, King Crimson, John Lennon, Pulp's Jarvis Cocker, the Libertines, Roots Manuva, Aphex Twin, Digital Mystikz, and a great cover of the Rolling Stones' Ruby Tuesday by Franco Battiato. The soundtrack adds punch to the film's political feel as it's provided in the scenes with Michael Caine who is a hippie with some great taste in music. It's truly one of the year's best soundtracks. The film's cast is wonderfully assembled with small performances by Juan Gabriel Yacuzzi, Philippa Urquhart as Jasper's catatonic wife, Oana Paella, and Paul Sharma as Ian, a cohort of Luke's. Charlie Hunnam is pretty funny as the psychotic Patric while Danny Huston gives an excellent performance in the one scene he has with Clive Owen. Peter Mullan brings a comical performance as the corrupt cop Syd who has some hilarious one-liners as a man who helps Theo despite his own motives. Pam Ferris of Harry Potter & the Prisoner of Azkaban fame is very impressive as the midwife Miriam whose knowledge of births and history of the infertility epidemic is important to the plot as Ferris is amazing while sporting cool dreadlocks. Julianne Moore is good in her role as Theo's ex-wife Julian who hopes to reconnect with Theo as Moore brings realism and drive to her character who helps revitalize Theo's activism. Chiwetel Ejiofor is excellent as radical Luke who isn't a total villain but whose political motives make him a complex character who wants to do the right thing but is addled with the idea of no future as he's a character who is forced to make sacrifices for his own reasons. Michael Caine is brilliant as the eccentric, witty hippie-scientist Jasper who always brings a "pull-my-finger" joke whenever the film needed it. Caine brings a wonderful sense of humor and warmth to the film as he's the man who acts like a father figure to Owen's Theo character. Claire-Hope Ashiey is amazing in her performance as Kee, the young woman who is aware of her role as she tries to maintain her pride while knowing that she doesn't trust anyone other than Miriam and Theo. Ashitey is really the film's most breakthrough performance. Finally, there's Clive Owen in another magnificent performance. Owen really shows his depth as a man on the brink of acceptance of his own disillusioned role when he's thrust back into the world of activism. Owen really adds a bit of humor and heart to the character as he becomes an unlikely father figure to Ashitey in which, they have great chemistry together. If there's anyone, aside from Ashitey, that is the highpoint of the cast, it's Clive Owen. The 2007 Region 1 DVD for Children of Men from Universal presents the film in an anamorphic widescreen format to preserve a 1:85:1 theatrical aspect ratio with 5.1 Dolby Digital surround Sound in English, Spanish, and French with Spanish and French subtitles along with English for the hearing impaired. The DVD includes various special features to coincide with the film’s DVD release. The first big one is a twenty-seven minute documentary short film directed by Alfonso Cuaron entitled The Possibility of Hope. It’s a documentary about the possible end of the world due to many things including globalization and policing borders. With comments from various philosophers and scientists including Slavoj Zizek and Naomi Klein, the documentary film is filled with footage of a world in chaos and the idea that things might not get better but there’s also a semblance of hope that might happen. It’s a very compelling piece from Cuaron that unveils the idea of what might happen if things do go bad like in Children of Men. Other features includes three deleted scenes that total for nearly two-and-a-half minutes that includes a small scene of Theo giving a homeless man a cigarette while an immigrant is getting illegal dental work, a scene of Theo being confronted by his landlord about rent, and a scene where Theo talks to Arthur that got cut from the final film. The six-minute interview with Slavoj Zizek has the poltical/social commentator discuss the film’s themes and why he thinks it is an important film for the way it plays the world in a state of chaos. He also compares the film to Y Tu Mama Tambien as they’re both road movies with backdrops of a world changing. The seven-minute, thirty-five second Under Attack featurette is an in-depth look of how the filming was made for two of the film’s intense action scenes including the car scene where Theo, Julian, Kee, Luke, and Miriam encounter rioters and the opening scene where a café blows up. Cuaron, Clive Owen, Julianne Moore, Chiwetel Ejiofor, and crew members reveal how some of it was done while in the car scene. A camera was made above the car to slide and spin around to capture everything that is happening while where’s a driver in front of the car that is unseen while a small crew is up there. It’s truly a wonderful look for those wondering how these scenes are done. The four-minute, thirty-nine second Theo & Julian featurette discuss the two characters and their development where Cuaron, Owen, and Moore revel into the character’s history and why their story is important to the main plot of the film in relation to Owen’s character. The eight-minute, thirty-seven second Futuristic Design is about the making of the film’s art direction where Cuaron and his team of set designers and costume designer Jany Temime discuss what needed to be done. They wanted to aim a very realistic look while creating shantytowns that was unheard of since England is cold and never had such a thing. The three-minute featurette on how the birth scene is made is shown just as the scene is playing from the way it was originally filmed to the final additions made in the visual effects. The overall DVD is superb for the special features is added while actually providing something that is worth the money for this film’s home video release. 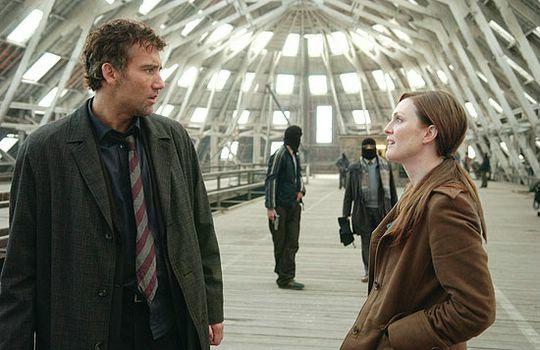 Children of Men is a sprawling, intense, and harrowing film from Alfonso Cuaron. With a great cast led by Clive Owen, Claire-Hope Ashitey, Michael Caine, Julianne Moore, Pam Ferris, and Chiwetel Ejiofor, and a great crew led by cinematographer Emmanuel Lubezki. This is truly one of 2006's best films as Cuaron continues to delve into different film genres and such. Along with fellow Mexican auteur Alejandro Gonzalez Inarritu's Babel, Cuaron brings a unique vision to the world and how messed up it is whether it's in the present or in the future. In the end, Children of Men is a film that must not be missed by those who love dystopian imagery. Definitely one of the best post-apocalyptic movies of all-time because the look and feel of this movie. It's s dreadful and you feel like this world is slowly dying right in front of our eyes and it's so damn depressing, but it works and makes you think: could this ever happen? Nice review my dude. What I love about this film is that it changes one element - the ability to give life - from our universe and it believably shows what would happen - it's pretty much the same world, only bleaker, darker and hopeless. It's really a great film, though I found the last act to be dragging a little. @Dan-Thank you. If you see the Possibility of Hope documentary short on the DVD, it could probably happen. Yet, there's way that we can prevent this. We just need to put in some effort. @Sati-It's pretty much one of the best dystopian films ever made. I think it just kept getting better towards the end because of the stakes that is happening. Great review. I really love this movie and it's one of the examples I always point to when I am explaining to someone the difference between "sci-fi" and "science fiction". Children of Men is the latter. @Chip-Thanks. I had it in my top 10 of 2006 originally but it ended up being my 2nd favorite film of that year behind Pan's Labyrinth. Great review. Children of Men is such a game changer, everything about it pushes the barriers set by film, it's just goddamn revelatory. That scene when the baby starts crying, jesus man... floors me. @Alex-I saw how that scene was made. Wow, it's still a stunning film. Especially in the power of seeing the baby in the middle of a battle where everyone stops and sees that little thing. And then... the fighting commences. I have no idea why I haven't seen this movie yet- it has an intriguing story, Clive Owen and Oana Pellea, a fellow Romanian! Must get on it right away! Wonderful review Steven, as always! @Diana-Get it! Go see it now!! !